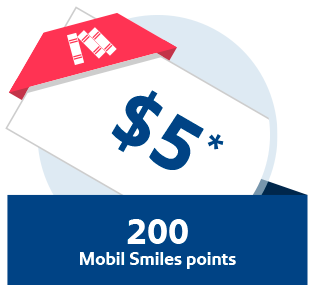 Collect your Mobil Smiles card from any participating Mobil service station. Simply get your Mobil Smiles Driver Rewards card from any Mobil service station. Find your nearest service station here. Start earning Smiles Driver Rewards points immediately by presenting your card to the cashier during fuel purchase. Your Smiles Driver Rewards points never expire, as long as you earn points on fuel at least once within a 12-month period! * $1 worth of Mart products with 40 Smiles points. Except alcoholic beverages and tobacco products. $7 worth of Synergy fuels with 250 Mobil Smiles points. 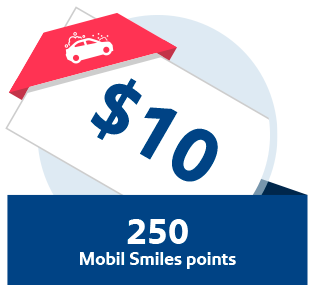 $10 car wash voucher with 250 Mobil Smiles points. $15 worth of Synergy fuels with 500 Smiles points. * $5 UOG voucher with 200 Mobil Smiles points. Redeem at Mangilao Mobil Station. Applicable only at the University of Guam (UOG). Now, you can convert your Smiles Driver Rewards points to air miles online. Simply register your Smiles Driver Rewards card to login. Convert your Smiles Driver Rewards points to United MileagePlus award miles. Find out more. Convert your Smiles Points into a donation to the American Red Cross through instant redemption at our Mobil service stations. Every 200 Smiles points can be redeemed as a $5 donation to help make a difference. Register your Smiles Driver Rewards card to start redeeming your Smiles Driver Rewards points for rewards. Don't have a Smiles Driver Rewards card? Get yours now at a participating Mobil service station near you. Our range of Synergy fuels is formulated to provide you with quality fuel for your journeys.